Looking much like other Origanum vulgare species, Creeping Golden Marjoram is different because it flowers only occasionally. Mowing helps to keep it flat and soft to walk on. 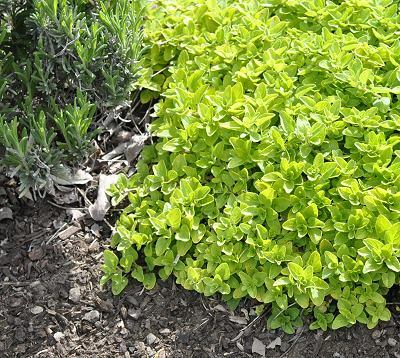 A lovely chartreuse in spring and fall (first photo below) , Creeping Golden Marjoram takes on a greener hue during summer (second photo down). 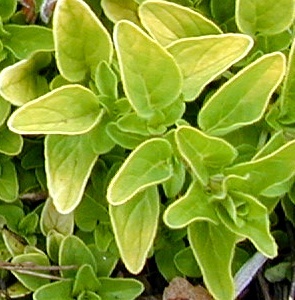 Creeping Golden Marjoram makes a tough and attractive ground cover and lawn substitute. In the picture above, the two Creeping Golden Marjorams (planted from our three inch pots) are about four months old and have already reached about eight inches in diameter. This three year old swath of Creeping Golden Marjoram flows under Yellow Lavender to the left and Sachet Lavender in the rear. This "river" of oregano is about 10 feet long and about 4 feet wide in the front. This is planted in a partially shady spot (about five hours or so of sun a day) which it really seems to love. However, the shade does make it grow taller and we do have to cut it back to about an inch twice a year or it would grow over everything. 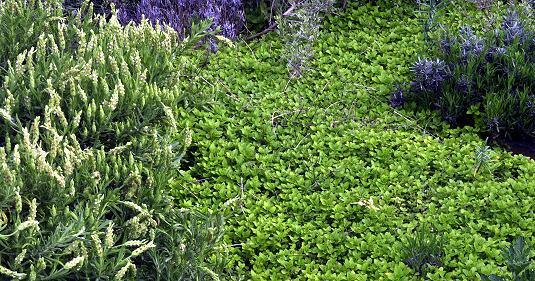 Creeping Golden Marjoram is often included in our 36 Pack Alternative Lawn Assortment along with Mounding Marjoram and Creeping Oregano. This plant is often available in plug trays. These trays hold 128 of all the same plant. They are a great low cost way to fill a lot of space. Each cell is 3/4 of inch by an inch. 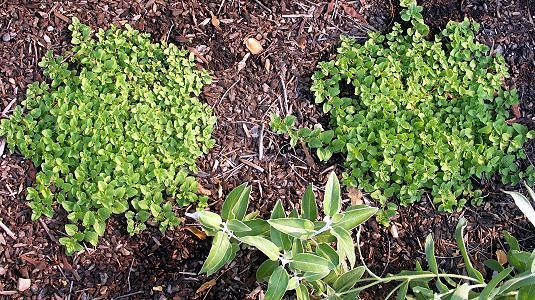 Check here to see if Creeping Golden Marjoram Plug Trays are available.